Hello again! Technical problems prevailed and have slowed my progress with the blog. Funny enough, the efficiency of the Philippine internet was a topic in the paper today here in Manila’s issue of The Business Mirror. The difficulty with speed, according to this article, has to do with the Philippines being an archipelago. No surprise then I had trouble in Bali, another member of an archipelago. 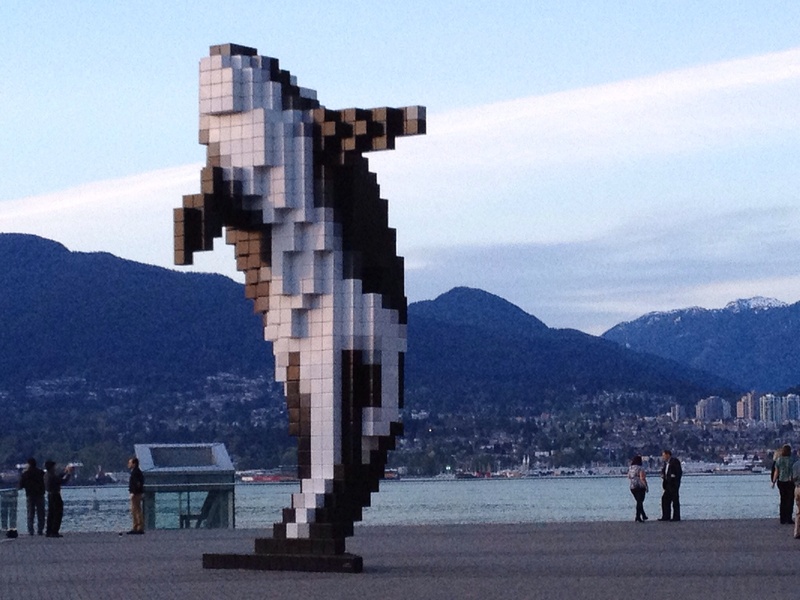 This orca sculpture at the waterfront looks like it is bit mapped in 3D! I had planned to bicycle around Vancouver, but honestly, the air was nippy and clouds seemed to threaten rain so bicycling didn’t seem like the appropriate choice. 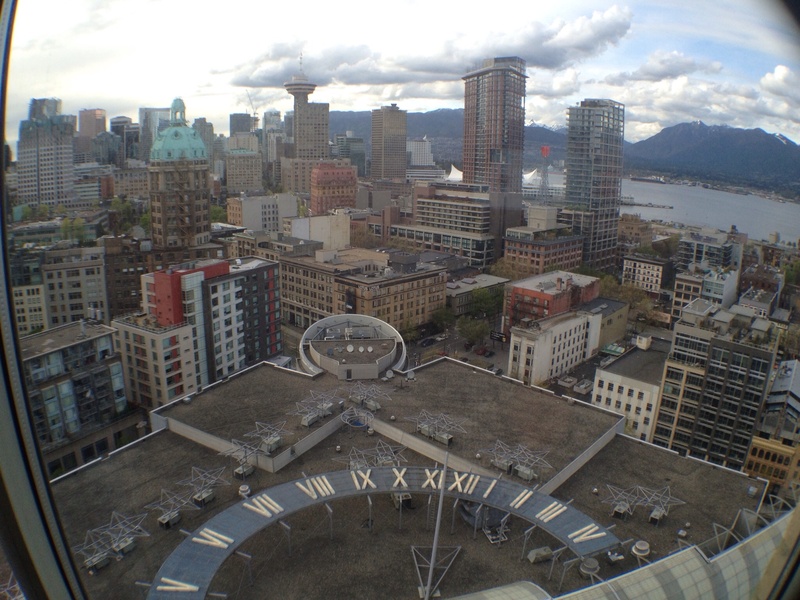 I did find downtown Vancouver to be very walkable so long as you have a bit of time to get where you’re going. 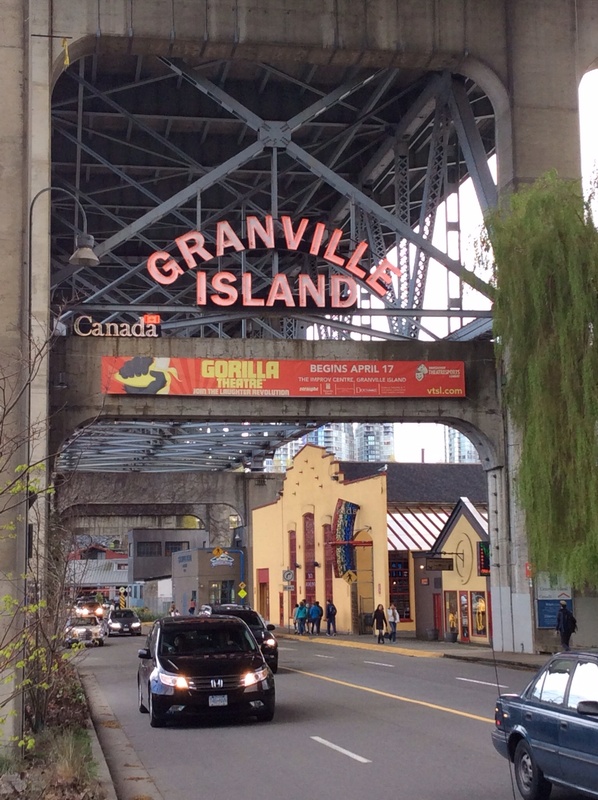 Walking across the bridge to Granville island I passed quite a few people also on foot. 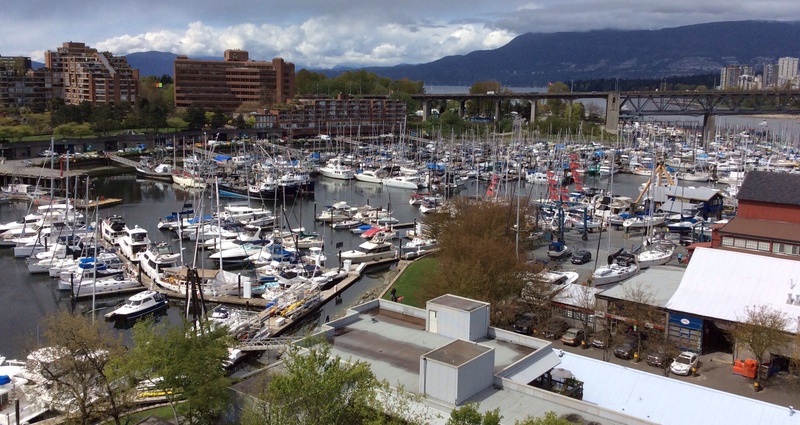 View across harbor from the bridge leading to Granville Island. My “hotel” for this part of the trip was a woman’s high rise apartment. I couldn’t have chosen a better location. I was totally made to feel at home and received excellent suggestions on everything from dining to day trips to technical gadgetry. View from the room I stayed in. 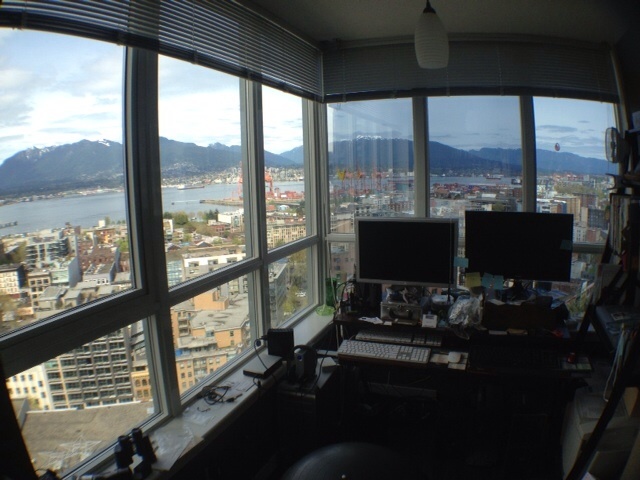 Rosanna lives on the 26th floor of a building in downtown Vancouver. Built adjacent to a mall, the roof below her living room window (and the room I stayed in) sports a sundial-looking clock. As luck would have it, surrounding buildings are all quite low and seem to be arranged in ascending levels of height away from hers. There are no close towers to make you feel like someone can look right in. Even more advantageous are the low buildings between her, the river and the mountains beyond. Her office view gets the full benefit. 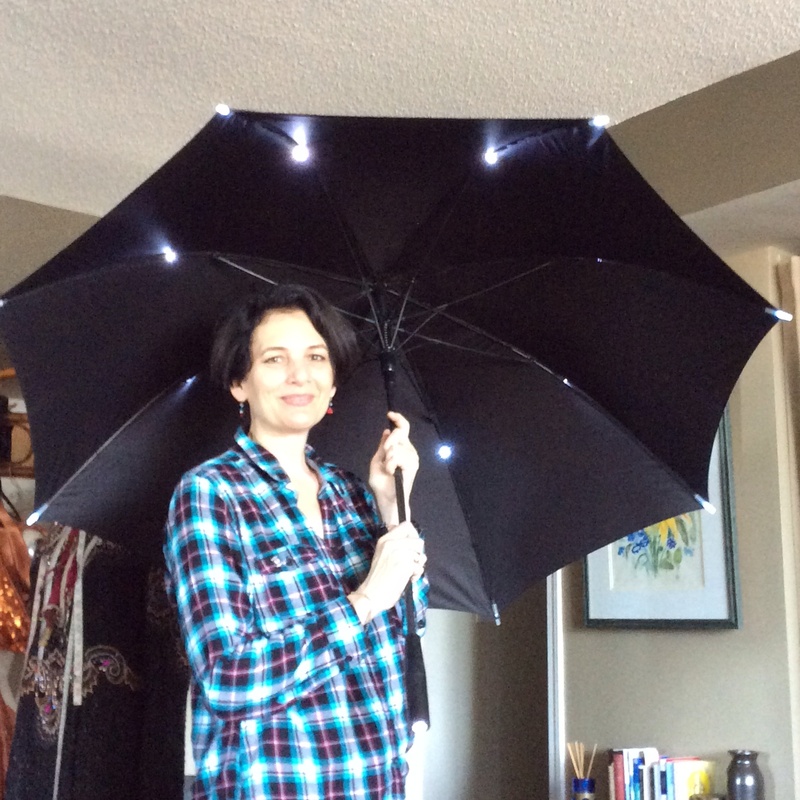 Roz showing me one of the light-up umbrellas her father imported. Roz’ building is situated on the edge of Vancouver’s Chinatown, and also very near to another neighborhood called Gastown. 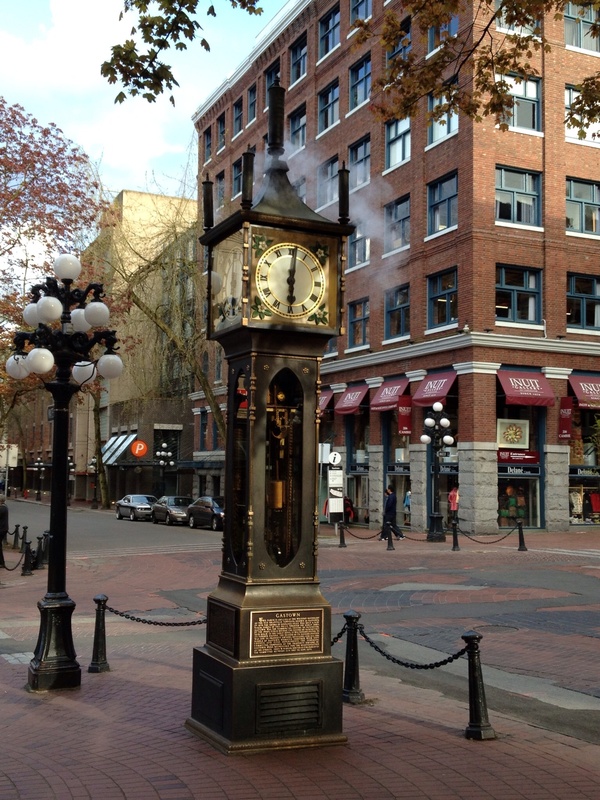 Gastown, marked by an unusual steaming clock, is quite trendy with numerous bars and restaurants that make the ‘cool’ list. My first evening in Vancouver, Roz and I checked out a few of these places and every single one was packed. 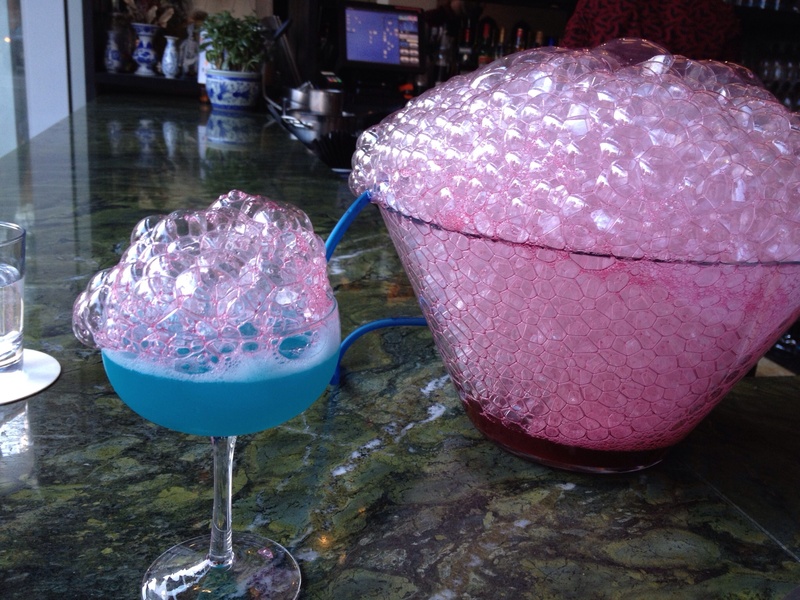 The bar and restaurant Bambuddha serves up unique cocktails including this blue one topped with bubbled hibiscus. 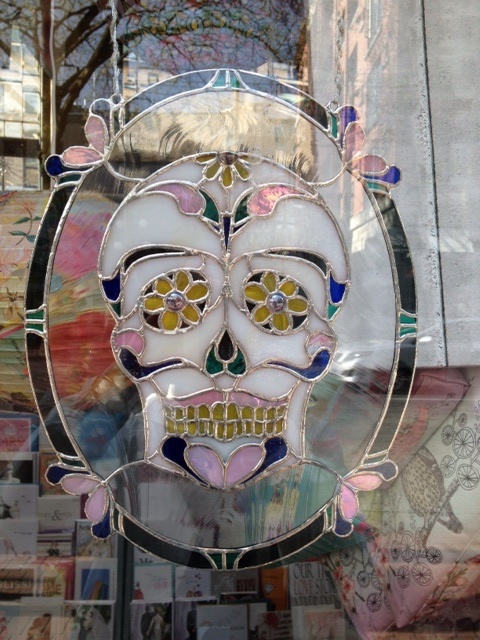 Day of the Dead stained glass in Gastown window. Roz had suggested I try going to Grouse Mountain. This ended up being easier than I thought. A short walk to the waterfront and I was on a swift aqua bus crossing to Lonsdale in no time. The aqua bus took less than 15 min. from start to finish. You then exit this station directly to where several buses are waiting to depart for various locations. A regular city bus takes you up into a very nice hillside neighborhood and terminates at the cable car for Grouse Mountain. 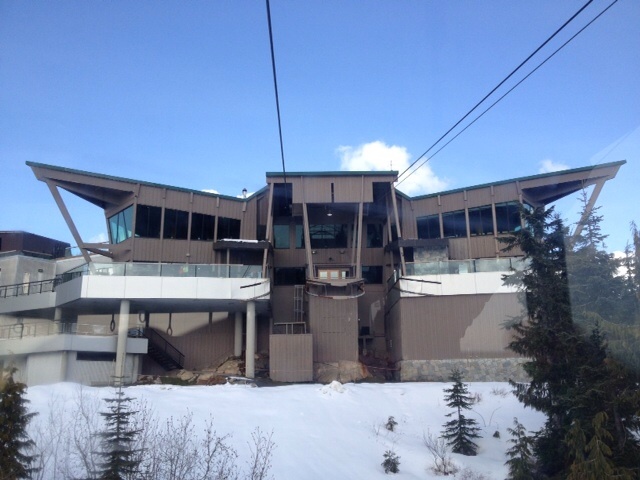 The restaurants at the top of the cable car leading to Grouse Mountain. 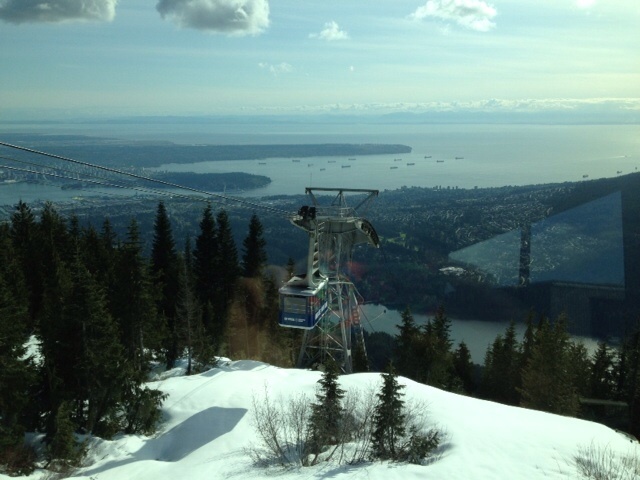 Cable car to Grouse Mountain. I also learned about something called The Grouse Grind. Stairs had been built into the hillside, straight up the mountain. An adventure group had originally created the stairs for the purpose of making a challenging course but it must have realized mutual benefit for Grouse Mountain because they had taken on helping maintain the course. FYI – these are not cement steps but from what I saw in the cable car, well-kept steps of dirt reinforced by wood and rocks. There is a website that can be Googled for anyone so inclined. Several people rode down on a cable car with me who had obviously just completed a hike up the hill. 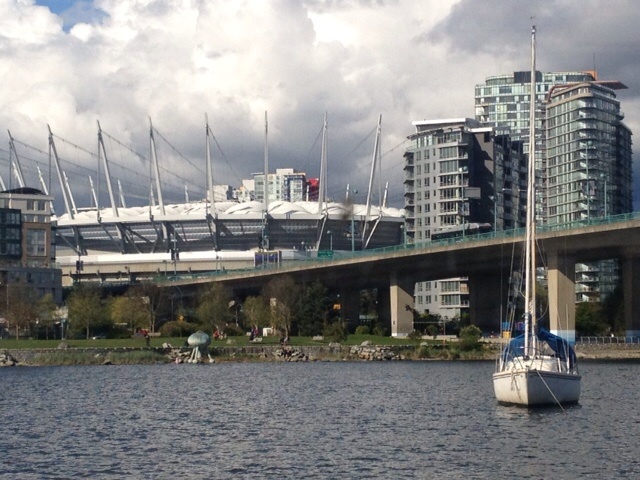 This shot of the Vancouver Stadium is from a little aquabus I took from Granville Island to Yaletown, a closer point from which to walk back to where I was staying. I really enjoyed the methods of transportation available in the Pacific Northwest. It was so easy to get around cities, or between cities in an efficient, affordable fashion sans car. Roz doesn’t even own a car and I can see with such amazing infrastructure, why would you?!? My next post will map my coming course of travel. Stay tuned! Sounds like a dream…Apartment with a gorgeous ocean view, cool neighborhood nearby, hiking mountain accessible, and no need for a car! Too bad we aren’t Canadians. I know! Lots to love about the place 🙂 Vancouver had the ‘feel’ of London but seemed more tame (less punk, or something). Wow, what a beautiful place. And the view from where you stayed, incredible. The cocktail looks great, I’ve never seen anything like that before – I did once have a cocktail in Jakarta that had candyfloss on the the top, that was good but very sweet! I like The Day Of The Dead stained glass. Thank you for the comments Lottie! You will also enjoy the view that I just had at my latest stop-over in Singapore- that was almost twice as high overlooking the harbor. Both stays were great. Candy floss? Is that what we call cotton candy in the states? That would be sweet! I asked the bartender how he went about inventing his creations. He said he just went around Vancouver to see what other places were doing and then tried to create something totally new. He was obviously successful since he also happened to be on the cover of their local paper with that exact drink!